Warsaw: City of Ruins is a smooth, classic-feeling city building game that plays quickly without feeling aimless and offers choices without being overwhelming. 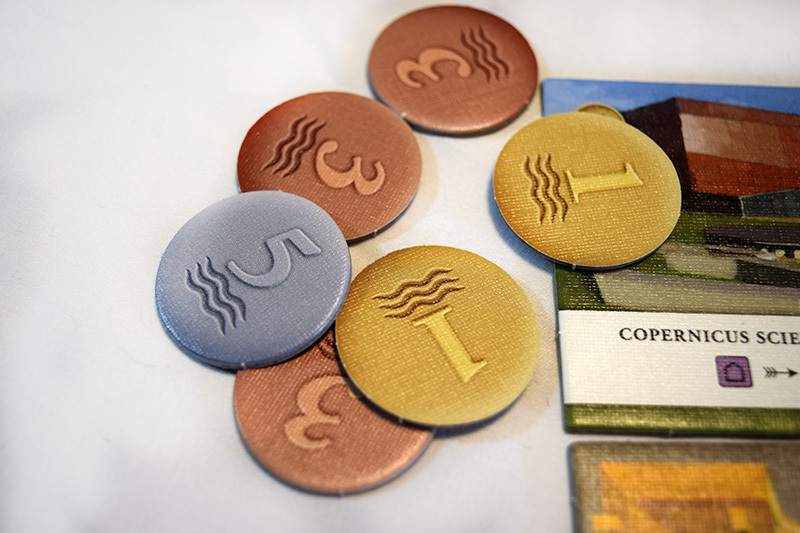 With strong, favorable comparisons to games like Among the Stars and 7 Wonders, asdf is an excellent candidate for any game night. Warsaw, I have learned, is a fascinating city. Built and rebuilt over its own bones, it is a city of deep history and enduring legacies. And in Warsaw: City of Ruins, you and your fellow city planners will oversee the construction of your own district of the titular city, drafting city tiles over the course of several epochs to see who can build the most glorious section of the city and be named the victor! Gameosity received a review copy of Warsaw: City of Ruins. We were not otherwise compensated. Jess: Now I love a good city-building game, and Warsaw: City of Ruins does a few things I really like right off the bat. I love the aesthetic – the bright district colors are really great, and the drafting gameplay is really quick once you get into it. A game of Warsaw: City of Ruins lasts for 6 rounds, or epochs, each one representing a period of growth in the city’s history. Each round has a construction phase and an income phase. 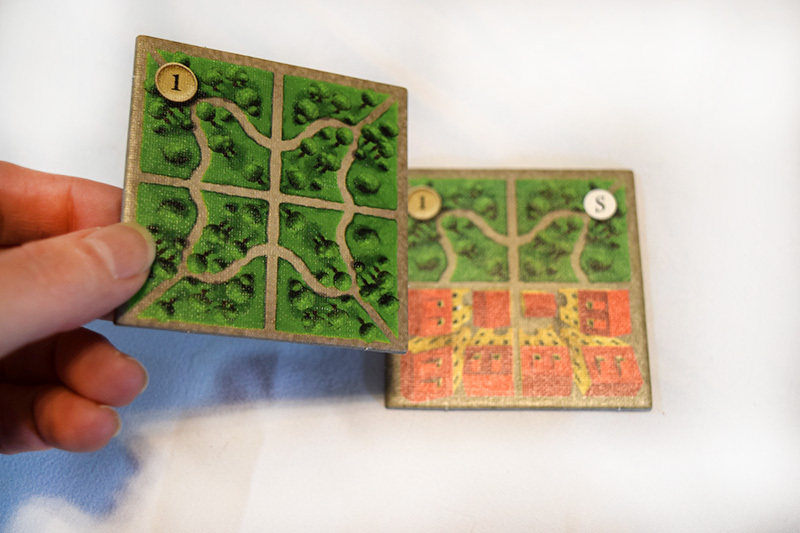 In income, players will receive coins and points based on the areas they have created within their city – areas are connected blocks of like-color structures. Also during the income phase, players will determine who gets that epoch’s monument, a special building of unique value to the district which hosts it. Smart planning (and drafting) will help players gather the coin needed for future rounds, and the points that everyone is ultimately after. Jess: I love the puzzle that Warsaw: City of Ruins presents – with each tile I add, how can I craft the best, most profitable, most valuable district I can? Andrew: Same! And adding to the strategy is the fact that your district can only be 3×4 or 4×3 tiles – you can’t just grow outward forever! Instead, you’ve always got the option of building over previously-placed tiles. The cost for doing so is reduced by the tile you’re covering, so there’s plenty of incentive to always consider this strategy, and it will undoubtedly become necessary in the later epochs. Andrew: Not to mention in the aftermath of the two wars. True to the tragedies of history, World War I and World War II will leave their mark on your district – at the end of the 3rd and 5th epochs, one of your tiles (and any tiles beneath it) are discarded to the box. You can rebuild, of course, but the loss happens just before income, so it’s important to plan for it. Jess: So, worth noting that the first time we saw Warsaw: City of Ruins, it was called Capitals, right? Andrew: Yep. That was its name in its original European print. However, when North Star picked it up for US distribution, they wanted to pay tribute to the unique city you’re building. And if you want to learn more about it yourself, then the Warsaw: City of Ruins instructions has a ton of interesting info on all the unique buildings represented in the game. 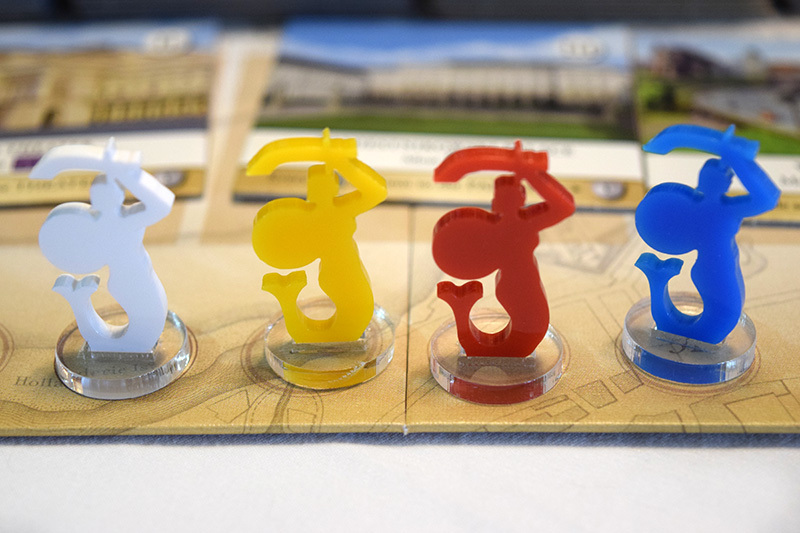 Jess: I don’t think much has changed in the two printings – great, subtle aesthetic, fantastic box insert, silky smooth gameplay, and kinda odd scoring markers. Andrew: Actually, mermaids appear on the Warsaw coat of arms, and have since the middle ages! Honestly, reading this game’s instruction manual was a delight of facts about this really fascinating city. But even setting engaging trivia aside, we strongly recommend Warsaw: City of Ruins as a light to medium weight game. The opportunities for interaction are fairly minimal – at most, you might choose to draft a city tile instead of passing it along to your opponents if you know one of them really wants it, but at the end of the day, it’s a quick, engaging game that has a really satisfying level of decision-making. Jess: I’ve got to say, I really enjoyed this one. 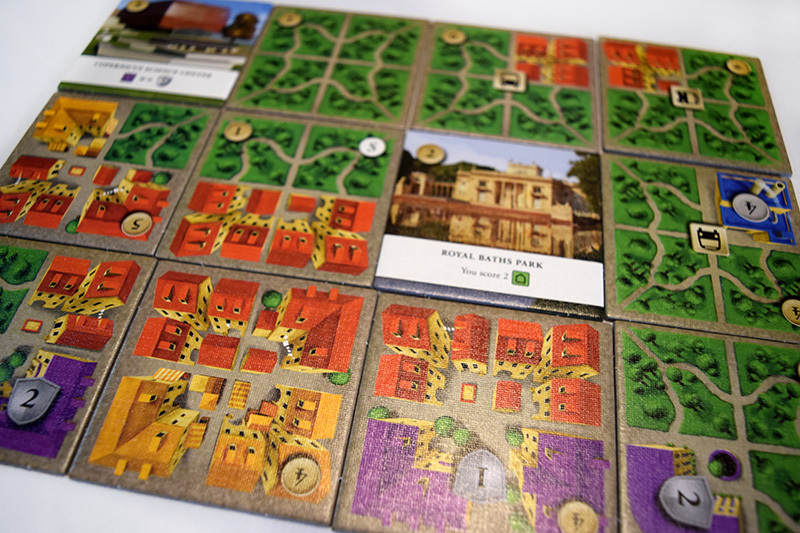 There are other games that do the whole ‘draft and build’ thing, some very well, but there was something about the presentation and feel of Warsaw: City of Ruins that made it super engaging without ever being fussy or complicated. Andrew: Totally agreed. This one’s a winner. We had a really great time with Warsaw: City of Ruins and highly recommend it. 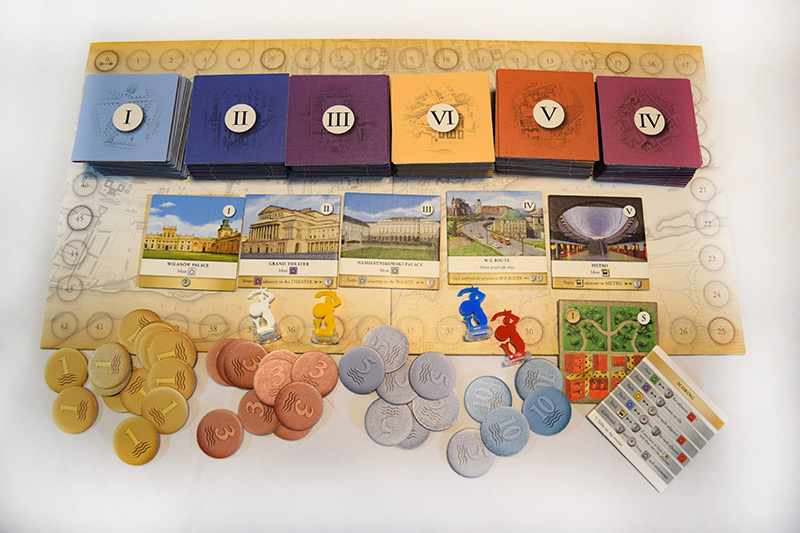 If ‘drafting and building’ is your jam, you might also want to check out 7 Wonders (or 7 Wonders Duel for its 2 player mode) or the absolutely excellent Between Two Cities.